Of course any amount donated is truly appreciated. There is no minimum. 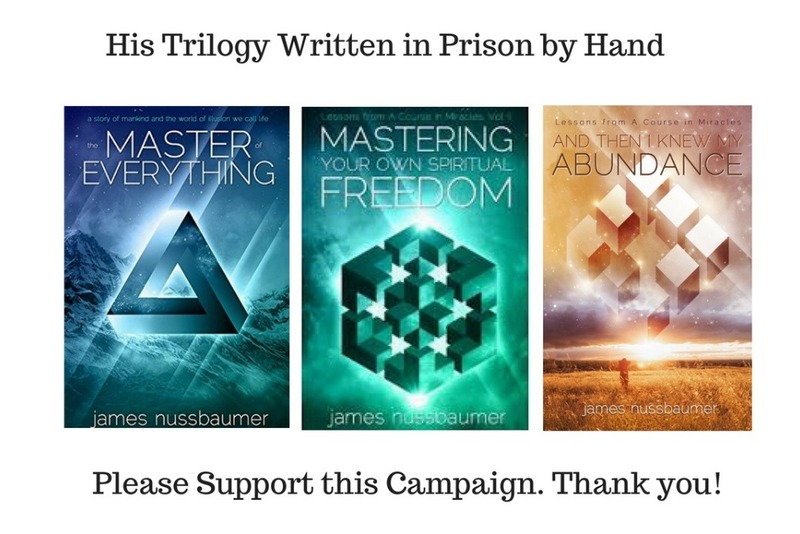 But with your donation of $500 or more you will receive the first three books of The Master of Everything series. Plus you will get a lifetime subscription to the author's EveryDay Miracles Master-Mind Challenge! I'm the author of these books above, which I'd written by hand where there was no computer or other resources in prison. I'd spent 8 long years of a 10 year sentence, over a foolish securities violation in my practice as a financial adviser. Most people may ask themselves why they should care to get involved in a campaign like helping a former prisoner who has a desire to help others in need. A psychologist I know telephoned me on the same day I was released from prison after those 8 long hellish, years. He told me to expect in the months ahead an adrenaline push that I most likely will incur called PTSD (Post Traumatic Stress Disorder). He was exactly right, and thanks to the Veteran's health care, since I'd served the U.S. Air Force honorably, I am able to be treated. But there are many who go untreated! This psychologist friend agreed with me that healing takes place in the mind. He spoke of the vulnerability issue and convinced me that for my own healing I needed to begin giving of myself and become involved in helping others beat adversity. Above is my prison photo, and when I walked out that prison gate on March 4th 2015, after 8 long years, all I had was a stack of my handwritten journals safely tucked under my arms. This harsh sentence was overtly political during a period of panic and abuse in the investment industry, a Judge seeing his way to use me as an example. While behind bars I began to write about what I was seeing, and my treasured material after many rejection letters finally landed an American publisher. A company who saw it their purpose to get involved. This ignited elation in me, helped restore my dignity, and I was able to boost my morale. But this was only a small step on the mountain ahead of me. When I discovered many of the reasons for prison overcrowding and people making mistakes and their loss of dignity, I was in shock that a nation such as the United States could allow this problem to escalate. My psychologist friend told me it was okay to let people help me raise money for my purpose, especially with my own great desire to help others by building this campaign to help promote my story. When we speak of rising above adversity, there are many in society that are invisible and often forgotten - those who are down and out, but have the desire to help make a better world. There are so many vulnerable groups in society, the number of women, men and youth who do not realize that they do have it inside themselves to live their true potential by helping the world--and this is what my books and speaking events are meant to accomplish! There are so many uncomfortable findings why so many children and young and old people today are serving prison time. My Psychologist friend knew all along while I was in prison what I had been working on, and that I have finally met a challenge that feels bigger than me and almost too big to face alone. He said, “Amazingly it takes a village of good people from every facet of life to see it a reason for them to get involved." By turns my literary work has drawn a main stream publisher, and my relationship with them continues to grow. I am grateful. But now I have the responsibility and commitment of building a platform and coordinating all that needs to be done for even broader social problems, and the complexity in trying to heal them. A mountain is surely ahead of me with all the current time opportunities for mindful reform as a whole and the development of a more progressive approach to dealing with our errors. While your support is critical to raising this platform and creating systematic changes needed, I'm gladly providing access to my articles, webinars, lectures and other events in your area Free to the world week in and week out, but there are so many costs involved that I must consume as the author. There's no doubt my securing a publisher was as arduous as any new writer suffers, with years of querying publishers and the normal barrage of rejections along with the difficulty of communicating from inside of prison. But I did it, and SO CAN OTHERS, too, who are down on themselves rise above adverse situations, no matter how low they are. So my point is, this is proof that I have the drive to build a great platform, and now at age 61 and with your support, I'm giving it my sincere effort to help others get up out of the gutter, and help even more from falling prey to the sheer desperation that led to my own errors; a mere hard fall, if you will, resulting in harsh and lengthy prison time. That's now behind me, and with your help, together we have the potential to help make a better world. The advocacy I mentioned means working with people who are experiencing hard times and to bring about positive changes in policies and programs on the local, state, and federal levels. When speaking of rising above adversity today, we seem to be more in tune than ever before in helping tackle these root causes! The world is changing for the good! It's called "Healing," of the mind. Will you please help me to make this possible? I promise to send you updates and progress reports through Facebook, Twitter, Instagram, You Tube, and other social media, because I know so many of you turn there for optimistic outlook. It's no surprise, for example, when someone is released from a lengthy prison term and re-enters society there can be extreme financial hardship. People need to know what's going on, and there's no time like now to take action in a great desire to offer something positive! I cheerfully celebrated the publication of my first book of this ever-developing , inspirational and uplifting series upon my release from prison, and now I'm developing strategies in small ways that may contribute to larger changes in the way people experience the many hurdles in life. But there are necessary promotions, resources, and more while I continue to build, write, study, learn, and yet promote more and being involved with all that must be addressed. I've calculated start up costs based on putting things in place so to attract several groups like churches and other organizations around the world, who may want to host quality rehabilitative programs. Please read on if you'd prefer while considering my request. Thank you kindly for your attention. Plans Include Non-Medical Wellness centers helping those heal from life’s struggles in many locations, beginning in the Tampa Bay area and Northeast Ohio. And other areas from there. One of the most common types of non-medical wellness training centers is one that you might find on a college campus, a senior citizen center, or within a large business. This type of wellness center is focused on helping students, seniors, or employees thrive in their environments by helping them deal with stress and anxiety over perhaps a loss, understand proper care for mind and body, and advise them on general health and well-being. Sometimes, this will include a referred health clinic staffed with physicians, but oftentimes it will be a separate operation. Maybe, for example, anyone from a student to a senior citizen who is down on their luck, where life seems against them, will have non-medical wellness support that focuses more on mental and general health and well-being. The Wellness support offers an introduction to mind-body skills within the group context and focuses on teaching participants how to use these skills in their own self-care and how to begin to integrate the approach and techniques for a better ongoing lifestyle. These simple, transformative skills are the ideal antidote to stress and burnout, and the perfect tools for anyone’s tool kit facing life adversities that seem far too large to handle alone. Overcoming stress and burnout, perhaps for the super-busy businessperson, and on the specific techniques used, as well as experiential work in an intensive, supportive small group. These approaches and the “Wellness Improvement” in which they are taught make use of peoples’ strengths; encourage them to experiment with their own abilities; enhance their sense of control; and are as well, interesting and fun. Here are 4 "Real Easy Reasons" why you will want to Donate and SHARE with your networks for this enthusiastic, extremely optimistic man's advocacy and campaign to offer something positive. James Nussbaumer has always been a driven individual and is merely bringing your attention to an environment conducive to his natural willingness to help. We all want less fear and despair in the world and more peace. Don't we? Written from deep in the rabbit hole of the prison system, his voice is direct and real enough to make readers want to learn more of his remarkable personal story. Nussbaumer, a former financial adviser, was indicted in 2007 and received a comparatively exorbitant sentence of 10 years in prison for misappropriating $128,000 in an attempt to offset losses incurred for clients--full restitution on his own efforts was made to those who lost. The severe sentence was overtly political, meant to "set an example" during a period of panic and abuses in the investment industry. Some months after he found himself in prison at age 50, a remorseful and shattered man, he was moved to a section housing "old" prisoners: anyone over 30. There, he made a startling discovery that led to an inner awakening and prompted him to start writing about what he was seeing and experiencing. James is a survivor with good cause and expects to excel for many years, but needs aid in his efforts, and has a request that very specifically demonstrates encouraging and inspiring others to advocate. During his years in prison with no computer he'd painstakingly hand-write in composition notebooks while surrounded by the chaotic, volatile, and often violent din of the cell block. He writes about redirecting the mental power of our mistakes--before we act them out--into positive results. And the books keep on coming! The Master Of Everything: A Story of Mankind and the World of Illusion We Call Life, is the first of an ever-developing series. James Nussbaumer operates on equal amounts of determination, faith, and hope, and says we can end suffering in the world even where those who struggle with being cold, shelterless, hungry, addicted and alone. James also adds, "The attitude we need to adopt to insure that the spark within us remains vibrant, to be happy today, is real easy: It gets better. Keep breathing and your life will improve." James is producing programs on personal development, inner peace and happiness where many who need and want help may learn to understand our healing power, those who are cold, down on their luck, and alone can learn with support how to get back on their feet and live happy lives. His plans include classrooms and group meetings throughout many areas in the world that help restore dignity for those who are lost, educational live creative workshops and seminars, lectures, webinars and online meetings, video conferencing and conference call services, evening programs at shelters such as a board game or chess night, an open mic poetry reading, a guest storytelling or musical performance, or a holiday party. He sees a "reverse panhandling" effect resulting from his cause. The whole combination of his material and services is instructive, challenging, humorous, and elevating, while revealing a way out of being lost or stuck in the spin of a seemingly unforgiving world. He frankly tells us, "If I can from those grueling conditions and circumstances of prison, so can others free themselves from what they only think has left them bound, fearful, and filled with anxiety!" James is asking for support without side stepping the issue: "I have a problem and need your help so I may reach others." Besides, he is committed and wastes no time. Upon his fifth plea, James was granted a release from prison by a forgiving Judge who became made aware of James' hard work and goals to help society. The Judge realized, it was a waste of taxpayer dollars to keep someone incarcerated who is neither dangerous nor a threat to society, but has a great desire to offer something positive. Since his release, James has wasted no time keeping true to the commitment he made to himself during all those long years of incarceration: an agenda he calmly and quietly scripted in his mind, for delivering his message to those seeking a path out of a maze of our own making. In addition to his services to the public, his down-to-earth ideas and strategies are already gearing him to private corporate conferences, executive board rooms, and personally helping attitudes and the secrets of living life without regrets. But all of this will have no chance of standing without a platform for caring about humanity. And he doesn't stop there, and will continue to speak at addiction and recovery services everywhere like AA , NA, Church groups, Local Libraries, and more, and share his warm heart with the long term and terminally ill.
His inspirational books, articles, other material, and both private and public speaking services are for everyone, and will result in putting the search for happiness firmly in place--within us--as a supreme knowledge of our own. He foresees once and for all the world using time for its wisdom, taking away the suffering and fear of adversity. Nussbaumer says, "After twenty-five years in the financial services industry--a business I loathed, though not immune to its perks--prison was the last place I expected to experience ultimate freedom. Now I hope to lead others on their own life's journey: the only journey worth taking." James doesn't let pride or cynicism stand in the way, because he knows God has programmed people to naturally want to help when they can. And waiting for the perfect time to be helpful means waiting forever. There's no time like now, and is why he's taking action! James Nussbaumer's down-to-earth personality has no notions of rugged individualism, and he realizes that his several years of public speaking experience prior to prison temporarily derailing him, had gone unattended to. That's why he has enthusiastically and almost immediately re-connected with Toastmasters International, lending him a "brushing up", if you will, on his communication skills. An example of his bull dog persistance and willingness to do what it takes. So for now his drive and determination asks for your donation in helping him raise start-up capital for implementing many strategies and raising up the author's non-medical, wellness platform . A donation you can psychologically feel good about as your heart swells, knowing that a lonely human being may get his dignity back, or that others may never slip into that state of mind. It's about transformation and spiritual enhancement, being happier and more fulfilled on an everyday basis, with dignity, and free will, which helps make humanity whole and creates a higher level of self-worth. James further believes, "This is an approach to living well that anyone in time can follow and I know will work. Individuals can relax and be happy in peace. It's because of my own healing mind giving me the desire to move forward, being why I've accepted their offer at Go Fund Me to locate willing financial supporters for this purpose." James is now available for interviews, feature articles, and book reviews. Note: Every situation is different so please consult with a tax professional for tax deduction eligibility. I'm re-building at age 59 where 8 years of prison left me penniless. I'm no slouch, wrote a book, but still need to get on my feet. The ones I've talked to about this have been great, where I no longer feel low about asking for help. People are naturally good. Thank you. The homeless population is too often misunderstood where dignity needs restored, and with the necessary resources helping others worldly get back on their feet is a mission you can mindfully be proud of. While my Hopeful Haven corp., a non-profit for the homeless launches, I am living proof that if I can re-build myself at age 58 where 8 long horrific years in prison left me stripped in many ways, so can others, too, get back on their feet. I ask for support building this campaign for a non-profit to help reaffirm hope for the homeless...a group in society that is invisible and often forgotten. Compared to other vulnerable groups unique challenges exist. People become homeless for a variety of reasons. Homelessness is primarily an economic problem, and is also affected by a number of social and political factors that can be overcome. Thank you, and please read on...and SHARE with your networks. I'm re-building at age 58 where 8 years of prison left me penniless. I'm no slouch, wrote a book, but still need to get on my feet. The ones I've talked to about this have been great, where I no longer feel low about asking for help. People are naturally good. Thank you. 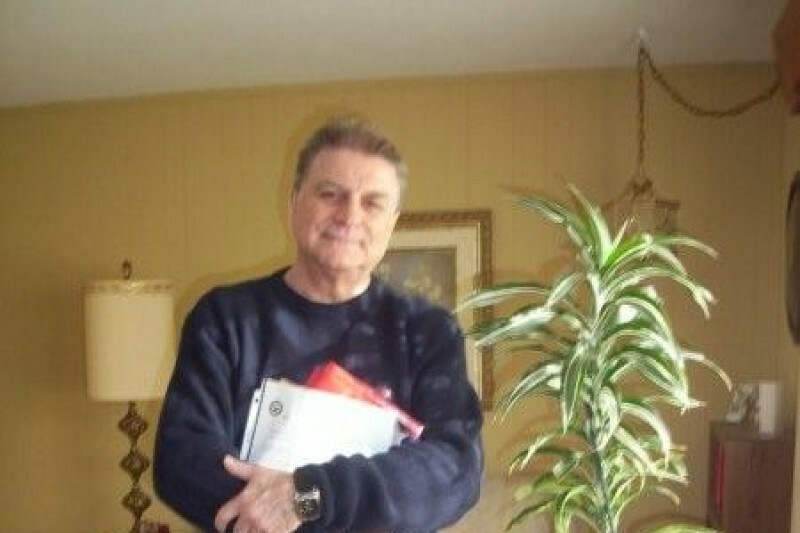 I'm re-building at age 58 where prison left me penniless. I'm no slouch, wrote a book, but still need to get on my feet. The ones I've talked to about this have been great, where I no longer feel low for asking for help. People are naturally good. Thank you.